All power is given unto me in heaven and in earth. Go ye, therefore, and teach all nations, baptizing them in the name of the Father and of the Son and of the Holy Ghost; teaching them to observe all things whatsoever I have commanded you. And, lo, I am with you alway, even unto the end of the world. – Matthew 28:18-20. Chiefly in Galilee did the Lord, by many infallible proofs, as He had promised them, show His disciples that He was risen and alive. There He finally appointed a certain mountain where they should witness a great manifestation of Himself. When they had assembled there, they saw Jesus. And they worshiped Him; but some doubted. 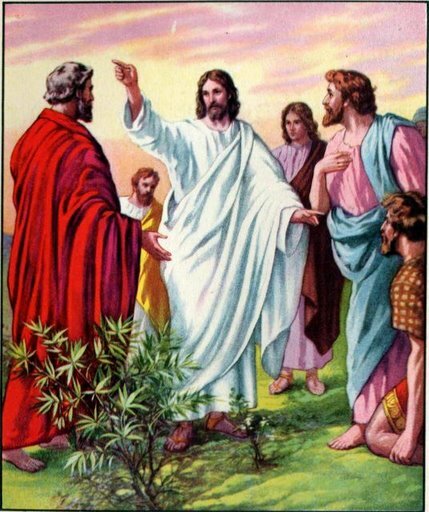 Jesus then spoke to them the royal words found at the head of this lesson. Christ the crucified had been raised and thus exalted by the Father, so that He, the Son of Man, had and used all divine power in heaven and on earth. But it is the will of Him who has redeemed all men with His blood, to bring all men to salvation through faith in Him. Therefore He commands His believers of all times to carry the Gospel to all people, and to make disciples of all who have been brought to receive that Gospel. Baptism is one means of grace whereby the Holy Ghost brings precious souls into the gracious fellowship with the Holy Trinity, in whose midst is Jesus, for He is the Son. The disciples of Jesus were to hear, learn, and observe every word which He had commanded His apostles, and which they have expounded to us in their writings by inspiration of the Holy Ghost. And Jesus is with His own alway, even unto the end of the world. He is always with our faithful testimony of Him; He is always with us as His Word is faithfully confessed by us. He Himself has declared: “My Word …shall not return unto Me void, but it shall accomplish that which I please, and it shall prosper in the thing whereto I sent it” (Isaiah 55:11). PRAYER – Omnipotent Lord and Savior, true God with the Father and the Holy Ghost, King and Lord of Thy beloved Church, which Thou hast purchased with Thy blood and sanctified with Thy Spirit: I give thanks to Thee that Thou hast made me, unworthy though I am, Thy disciple. Grant that I may use all diligence, so far as in me lies, to faithfully proclaim Thy Word, both Law and Gospel, at every opportunity. Always be with me according to Thy promise, until, finally, I shall come to Thee in Thy heavenly kingdom to be with Thee forever and ever. Amen. nor let Thy Word, that heavenly light, for us be ever veiled in night. that pure we keep, till life is spent, Thy holy Word and Sacrament. let us in its power confide that we may seek no other guide. and when our journey endeth here, receive us into glory there.